I RISE at 6am because the thought of wandering through olive groves by the light of a headlamp and climbing mountains as the sun floods the sky appeals to me. But as I’m getting dressed, silent flashes which momentarily transform a black world into vivid monochrome signal the approach of an autumn thunderstorm. The storm spreads its unseen clouds and the constellations are slowly wiped out. Thwarted, I return to my bed, still wearing my walking gear – though having had the good manners to remove my boots – to await the dawn and a change of fortune . . .
Daylight brings a fresh world of glistening leaves and red puddles. The storm is still rumbling away to the east, but by 9.45am the sun is cutting holes in slabby grey clouds and bits of blue are poking through. I pull on my boots, sling my pack on my back and close the door behind me. 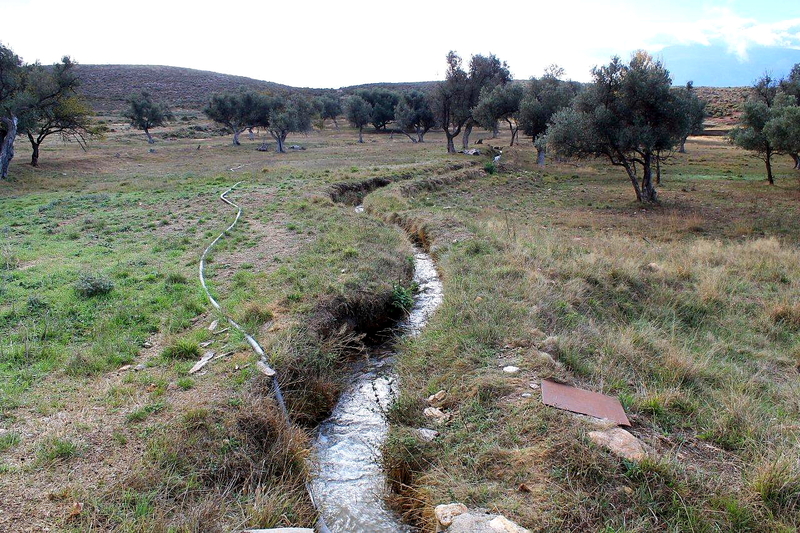 In the olive groves I see an old man and his son watering the roots of cherished trees. 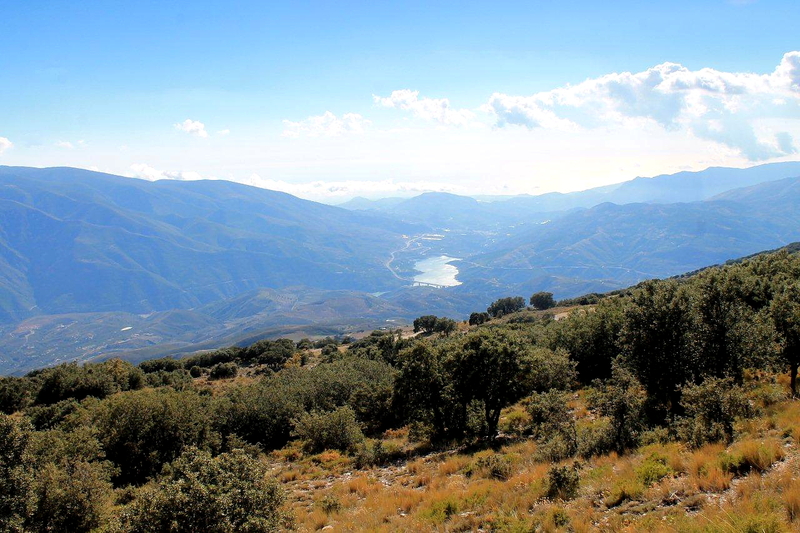 This seems a bit perverse, considering a thunderstorm has just drenched the land, but for the first time since June the acequias – the irrigation canals – are running, bringing fresh water from the high peaks of the Sierra Nevada. 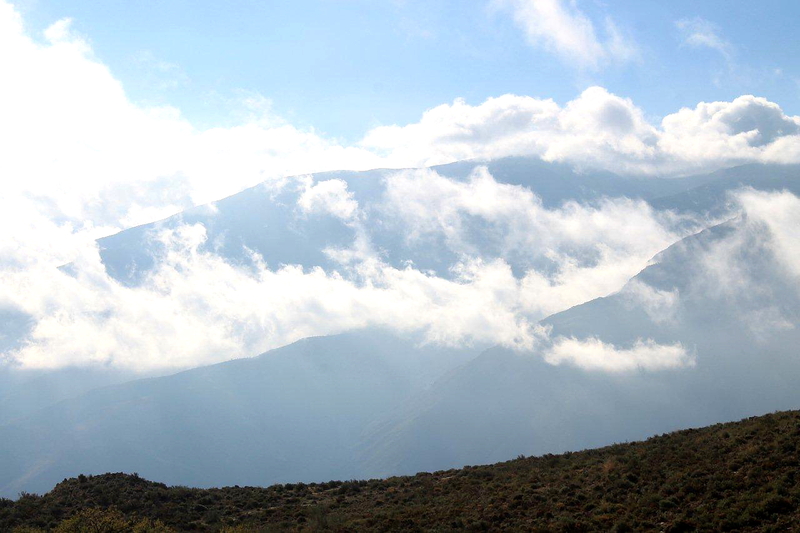 There was snow on the summit of Cerro del Caballo (peak of the horse) earlier this week. It has gone now – melted and soaked into the land to feed the springs. Running water is a strange sound up here. But it’s a very welcome sound. A considerable amount of thought has gone into planning today’s walk, not least because this is my first foray into the mountains since migrating to Andalucia in July and I don’t want to make a mess of it. Rather than head for the high tops – some of which I have climbed on previous visits – it is my intention to explore the middle reaches of this spectacular range. 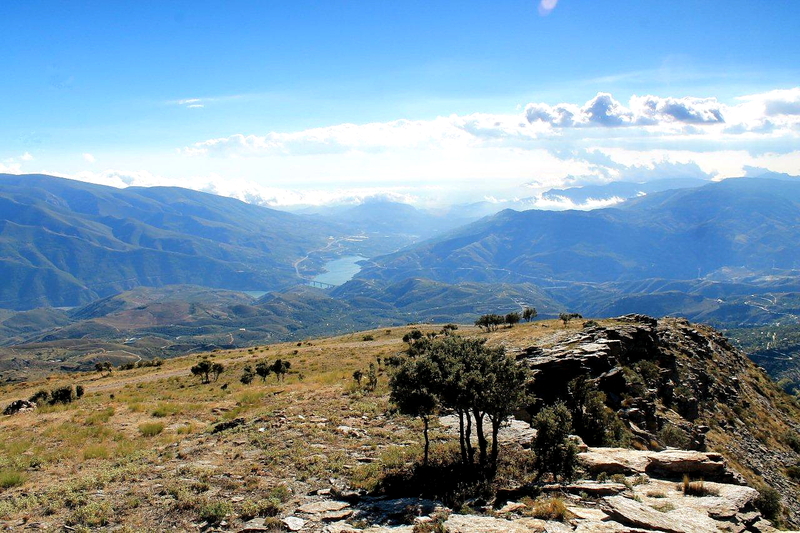 After all, the Sierra Nevada is the highest mountain range in south-west Europe, so there is no shortage of ground to explore. 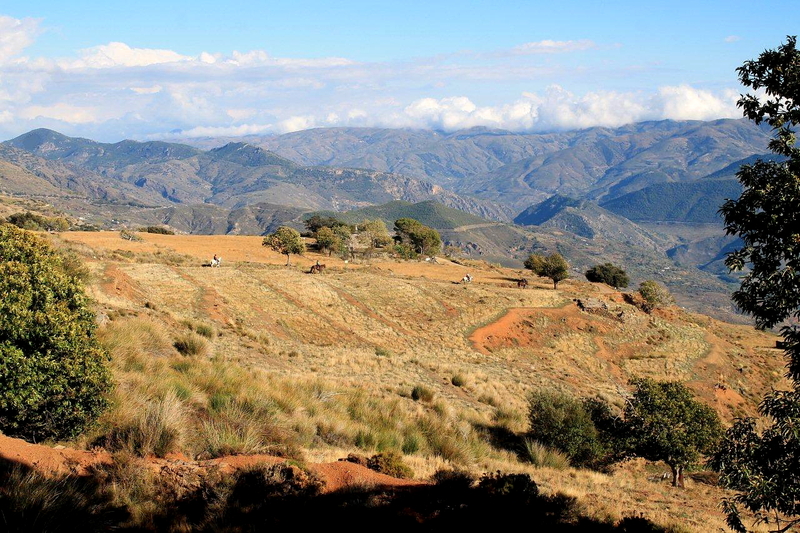 By 10.30am I’m standing on the GR 7 long-distance footpath, high in the pasturelands between the towns of Lanjarón and Órgiva. 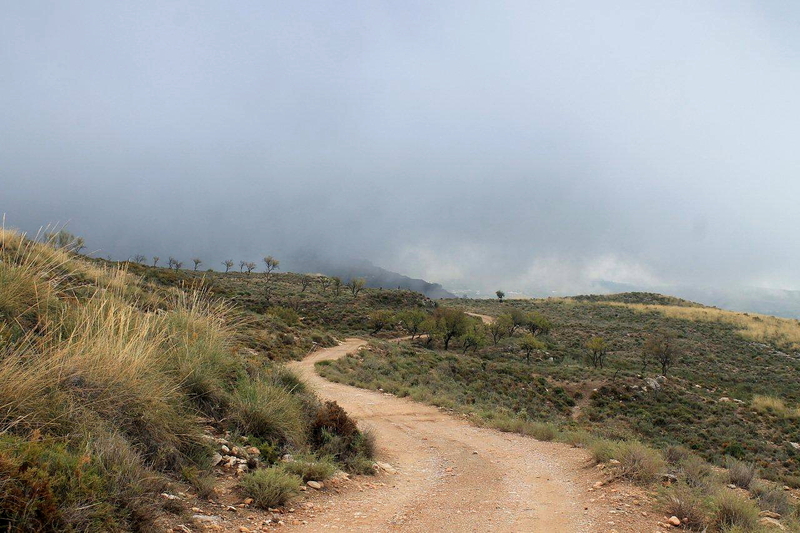 The GR 7 will take me to the village of Cañar, from where I will veer up the southern slopes of Pico del Tajos de los Machos to join another long-distance footpath, the GR 240. A forestry track will then take me by a circuitous though hopefully leisurely route back down the mountain to my starting point. 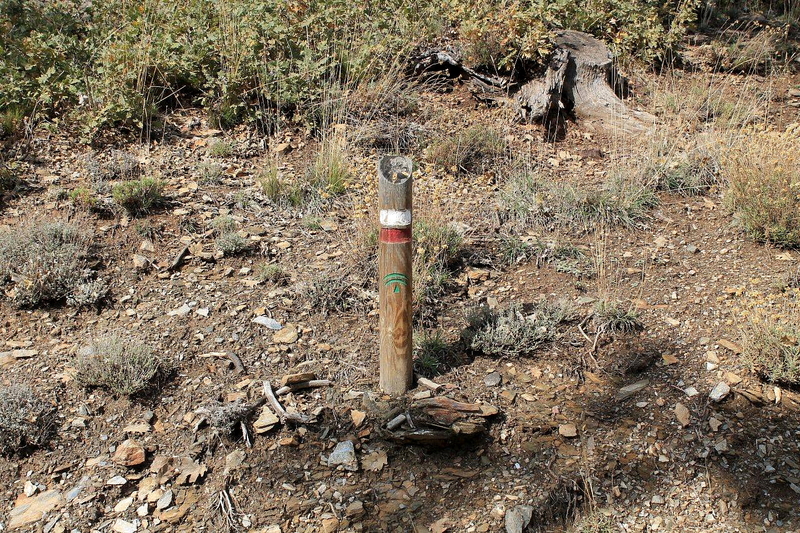 The mean vertical distance of today’s undertaking is 1,098m (3,602ft), plus some unavoidable ups and downs. 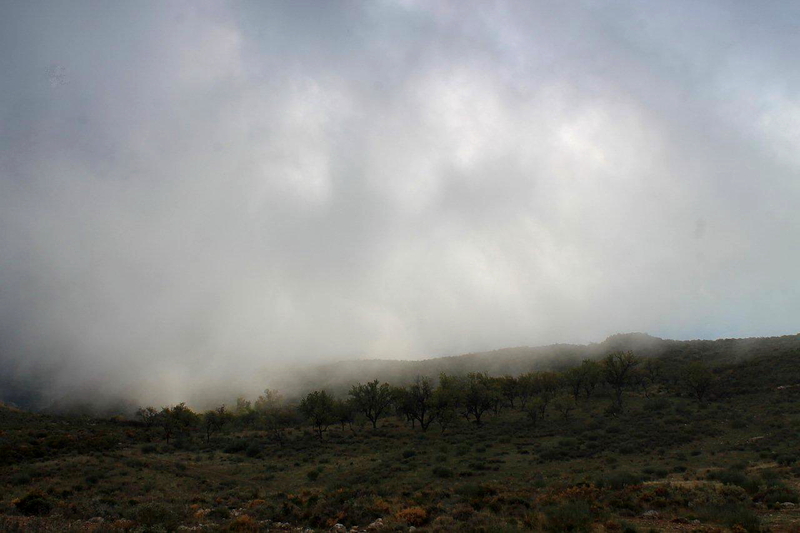 Cañar is already visible, its white walls gleaming beneath the retreating storm clouds. Between me and the village lies the Rio Sucio in its narrow gorge. The GR 7 takes me into the gorge by a steep and slippery route, crosses the river by rickety footbridge, then climbs into the sunlight across some precipitous ground, the pathway cut into the cliffs in places. It’s quite spectacular and, I must say, unexpected. 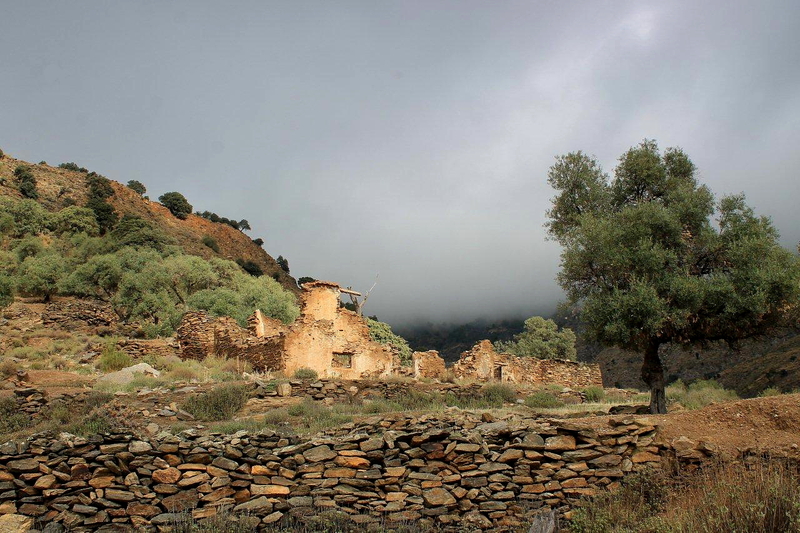 I am welcomed into Cañar by a very noisy dog which pursues me along a lane, snapping at my boots. I have been told by numerous people, since moving to Spain, that the time-honoured method of dealing with noisy dogs is to bend down and pretend to pick up a stone. This never fails, apparently. So I bend down and pretend to pick up a stone. The dog clears off but returns, barking, seconds later. I bend down again and choose a suitable cobble, which I hurl at the dog – just missing it. The dogs yelps, runs away, then regards me from a safe distance with sad eyes and a pained expression, as if I have broken the rules. I feel bad about the dog. But it took me more than fifty years to learn that you don’t get anywhere in this world without breaking rules. Perhaps both of us are on a learning curve, with the dog enjoying the distinct advantage of learning faster than me. 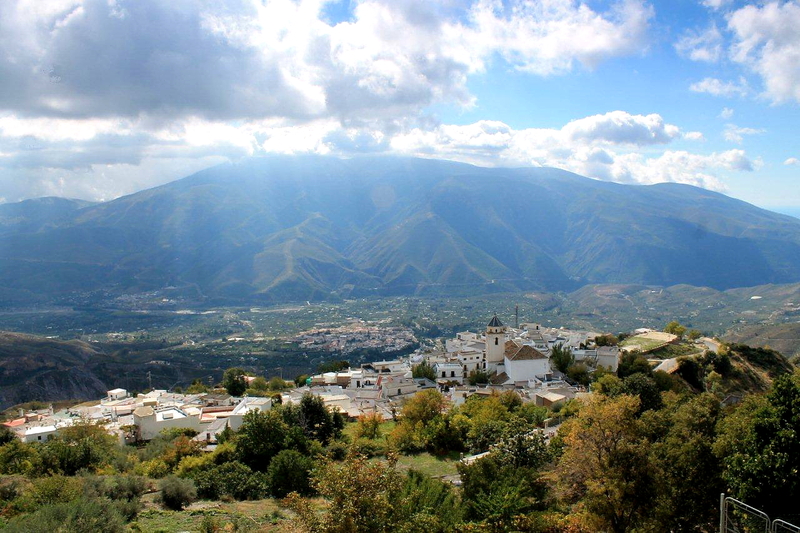 Cañar is one of the Moorish villages of the Alpujarras – the area of foothills and lush valleys between the Sierra Nevada and the coastal mountains – and at an altitude of 1,030m (3,379ft) is also one of the highest. 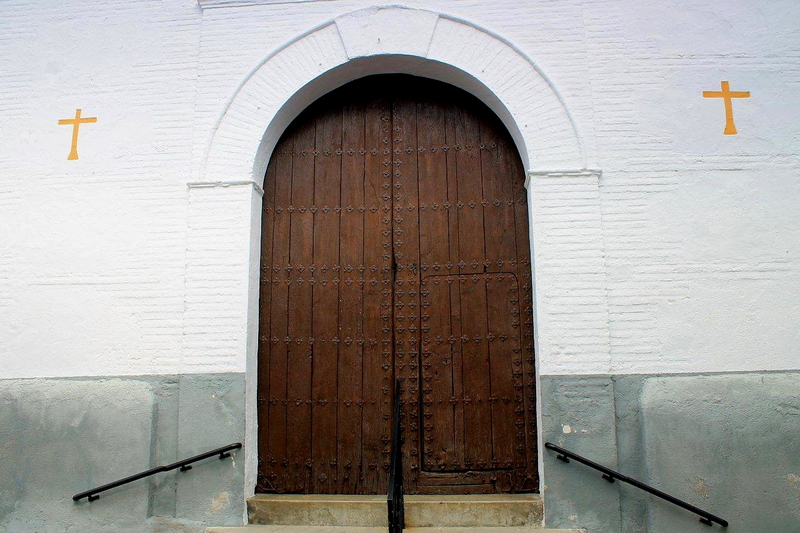 Its white-walled church was originally built as a mosque; its streets are barely wide enough to allow the passage of a donkey and panniers. For those with time to spare, it’s a pleasant place to tarry. Not me, though. I had a late start and the GR 7 was rougher than expected. 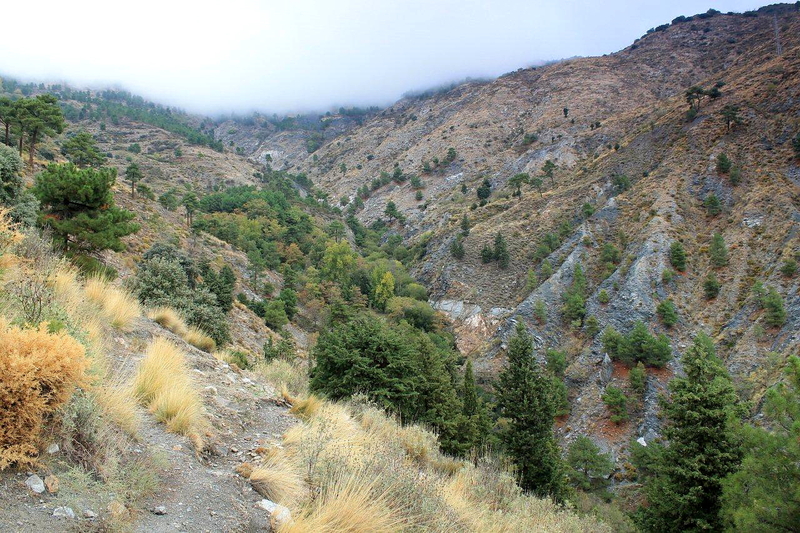 I take an old mule trail from the village and climb, in a series of zigzags, up the slopes of the Sierra Nevada to a forestry track (the GR 240) that cuts almost horizontally around the mountains at an altitude of about 1,720m (5,643ft). It’s during this climb that I realise I am not in the best of conditions. I haven’t undertaken a serious walk for six or seven months, and although I run and cycle several times a week, nothing prepares the body for mountain walking as thoroughly as the activity itself. By the time I reach the forestry track I’m experiencing leg cramps, I’m sweating profusely, and I’ve consumed nearly two litres of water. I sit myself in the dust – somewhat stiffly – eat a sausage and a carrot, and thank God (and Allah, just to be on the safe side) that my route does not take me any higher. By mid-afternoon the storm clouds have retreated far into the east. 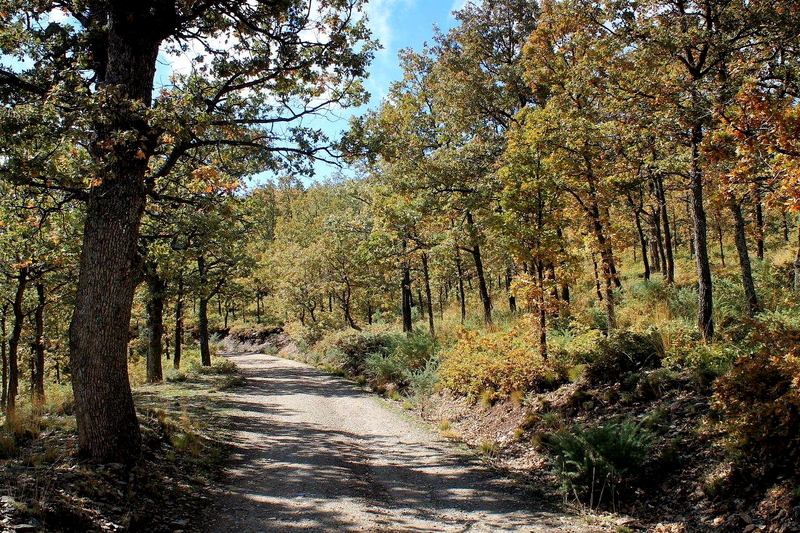 My route lies in the opposite direction along the forest track into the burning sunshine, and beneath boughs of oak adorned with autumn colours. 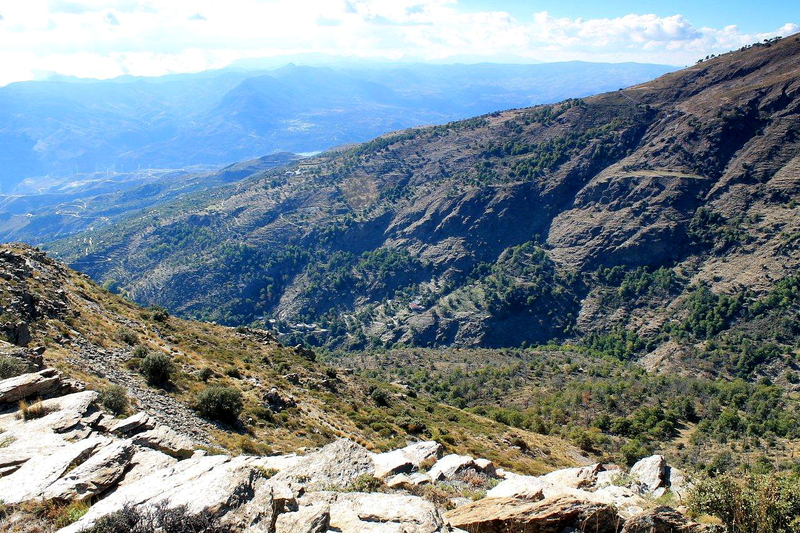 By 4pm I have begun my descent down a craggy spur overlooking the gorge of the Rio Lanjarón. 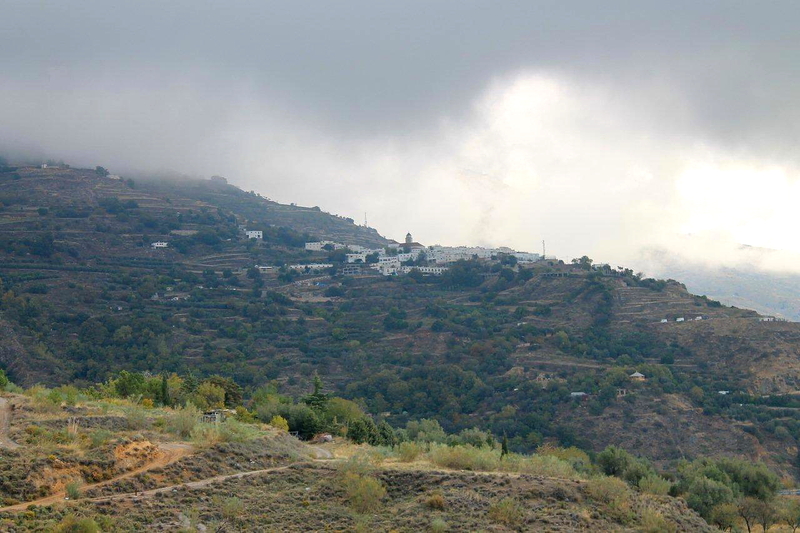 The blue ridges of the Sierra Tejeda y Almijara rise in the west, the grey-green bulk of Sierra de Lujar in the south. A smudge of Mediterranean fills the gap between the two. 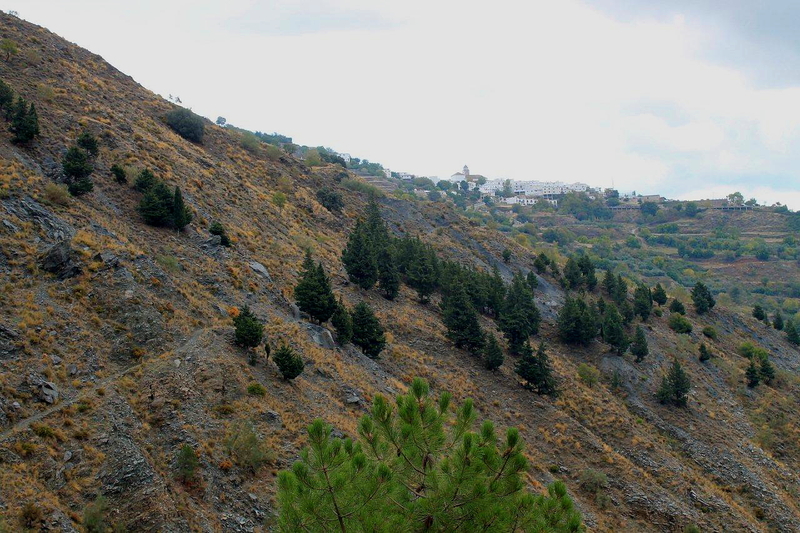 At the 1,300m (4,265ft) level I pass flat-roofed shepherds’ huts and squat houses surrounded by scrubby plantations. Further down the mountain the pastures become greener, assuming an almost Alpine quality. This is enhanced by the sound of cowbells, although I suspect the animals – all of which are hidden from view – are goats rather than cows. Nearly home now and my legs are as stiff as planks. Down in the olive groves the old man and his son are still watering their trees. We’ve all had a long day, it seems. But I bet my feet are sorer than theirs. 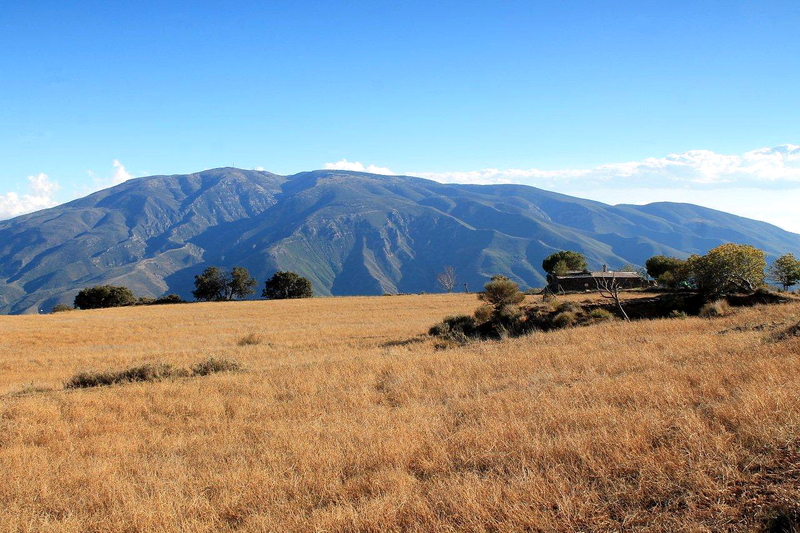 This entry was posted in Climbing, Footpaths, GR 240, GR 7, Hiking, Mountains, Religion, Walking, Weather and tagged Alpujarra, Alpujarras, outdoors, Sierra Nevada, Sierra Tejeda y Almijara, Spain, WPLongform. Bookmark the permalink. I’ve missed these posts, great to have two within a week. And super photography! Hi Martin. Thanks for that. When my legs return to normal I might get out again. So sorry you’re not in my home country any more! but the pix are still great. What made you leave, and are you planning to tell more about that? Hi Liz. I was made redundant from The Northern Echo, in Darlington, and because local newspapers are shedding staff like there’s no tomorrow we decided to sell our house and move to Spain. There are no jobs over here either, but the cost of living is far lower and the sun shines more. 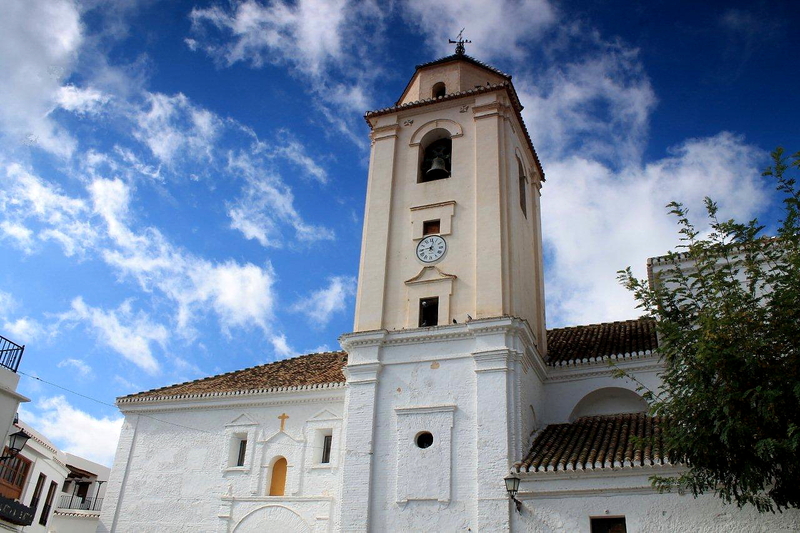 I’ve set up another blog which deals with life in Spain and the strange things that happen. If you want to take a look, just click the link. Beautiful photos and beautiful prose. Thanks for sharing your journey. Hiya Pat. Thanks very much. You’re welcome. Great day out. I hinted to you that the GR7 was good, as is the GR142. I had a dog follow me all the way from Lobras to Cadiar, he didn’t know the rules and just kept a distance from me and my stones. Only got rid of him by going into a cafe for lunch and finding a way out the back whilst he sat outside at the front – still feel guilty. Non sequitur – my father worked at The Northern Echo for 30 years on the Linotype machines until they were phased out. I also worked there as a ‘copy reader’ in my school holidays, 1960ish. It was a superb paper with a good balance of local and national/international news. 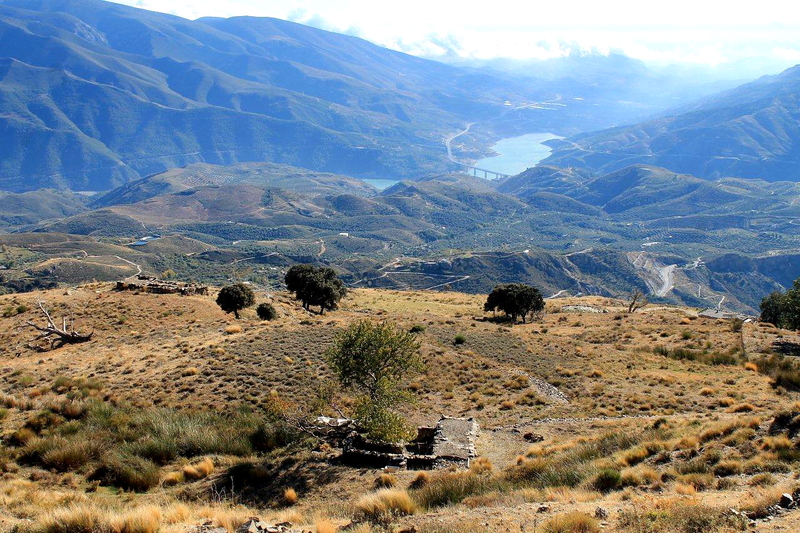 Their loss is Alpujarrras’s gain! The stiffness will go and you will be able to out again just because they’re there. Hi John. What a brilliant dog story. Wonder if he’s still waiting outside the cafe like Greyfriars Bobby, the poor thing. The GR7 looks great. I’m going to have a crack at it one day. 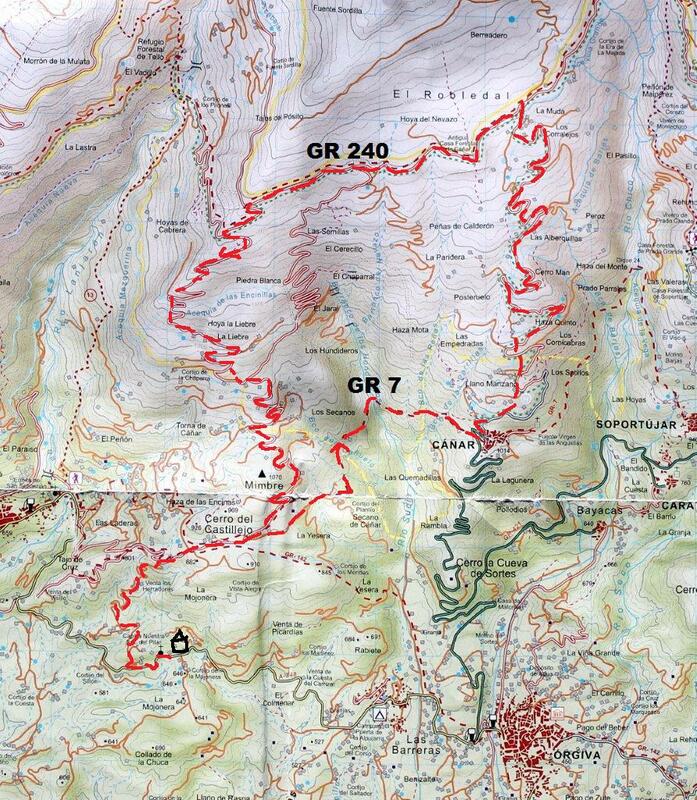 I see it overlaps with the GR 142 in this area. Must get my head round all this. You would not recognise The Northern Echo these days. All the comps, Linotype operators and proof-readers had gone by the time I started there in 1995. Since then the pre-press department has been outsourced to India, the subs desk (that was me and numerous others) outsourced to Newport, and the photographic department massacred. That’s progress, apparently. Still, health and happiness is what matters. I thought you were giving up this blog in favour of your new one? Great photos after the storm – I always like that light. I think you’d be suffering as much from ‘hot walking’ as from just hill walking – I always struggle to walk mountains in high heat. We have a big advantage here for hill-walking that it’s nearly always bloody freezing! Hiya Carol. No, the other blog is just a bit of diversification. This one’s my real interest. It’s been dormant because we’ve been concentrating on house-hunting. But now we’ve finally signed a contract on a new place (after a couple of setbacks), I don’t feel guilty about getting out in the hills. And yes, the heat is a problem. But autumn’s here and it’s quite pleasant at the moment. Look forward to seeing what the new place looks like! Hope house prices are better over there than here! As always a great post . Thank you for sharing. Hi John. Thanks for that, mate. It’s a pleasure. The high path through the trees looked great. I like it when a walk passes through different environments like that: a bit of open skies, a bit of canopy and so on. I’m sure it won’t be long now before you start finding the old features, like mining remnants, railway carriages and discarded tins of branded steak pies. Bloody hell, Chris. I’ve just realised I haven’t seen any Fray Bentos Steak and Kidney Pie tins over here. You can buy London Pride, HP Sauce, Pataks Lime Pickle and Jacobs Crackers, but Fray Bentos appears to be absent. I might have to set up an import company. And I just knew you’d comment on the dog – so that gave me a laugh. Yep, the mining remains will be appearing soon, I have little doubt, but the railway carriages might take a bit more work. Leave it with me. My wife makes a dish she calls scouse, in which the main ingredient is corned beef. So yes, the hamper sounds great. Can you put a Terry’s Chocolate Orange in it as well please? Hi Chrissie. Yes, it’s a great area. Alen, I’ve missed these posts, and it’s good to hear that you’re settling in sufficiently to resume BTT. That first photo is magnificent, and the rest aren’t bad either. Hi Martin. Thanks very much. Hi Lindsay. Had an email from Bert W the other day. Blimey, it’s like being back in Marton only without the Hartley’s Best. I am surrounded by lead mines, iron mines, fluorspar mines and even mercury mines (that stuff must be hard to shovel), it’s just a matter of getting my head round it all. Looks amazing. Glad to hear there’s some progress on the house-finding, and that you are out and about again. Thank you for that, Mrs P. It’s a long slog but we’re bearing up. Wow, that’s high! I’m not surprised you legs were sore. Canar sounds a very interesting sort of place. I’m not liking the look of that pass cut into the mountains, though! Well done, Alen. First dust washed off your feet! Canar is a lovely village. There are no cars because the streets are too narrow. Perfect place to get away from it all, but a bit cold in winter, apparently. That path looks a lot worse than it actually is. You could ride a bike along it. I enjoy your pictures very much and reading your story. You made me curious, with your pictures and I enlarged several of them to see all the details. It’s just like you are resurrected, Alen. I really hope you are all right in your legs and the rest of you (you nearly got me worried while reading) after the walk. – If not remember to thank Odin as well as God and Allah just to be very safe. I love this post. I’ve read it several times and I love to study the map as well. Hi Hanna. Thank you for your comment. I’ve been doing quite a lot of running lately and I thought that might have kept my fitness levels up – but it hasn’t. One decent walk in the mountains and I feel wrecked. Mind you, it might be old age creeping up on me (59 three weeks ago – that’s pretty old isn’t it?). But yes, different activities demand different muscles to be used in different ways. So the best way to keep in shape on the hills is to remain active on the hills. And I will remember Odin – and certainly Thor, because he was about in the storm clouds that day. 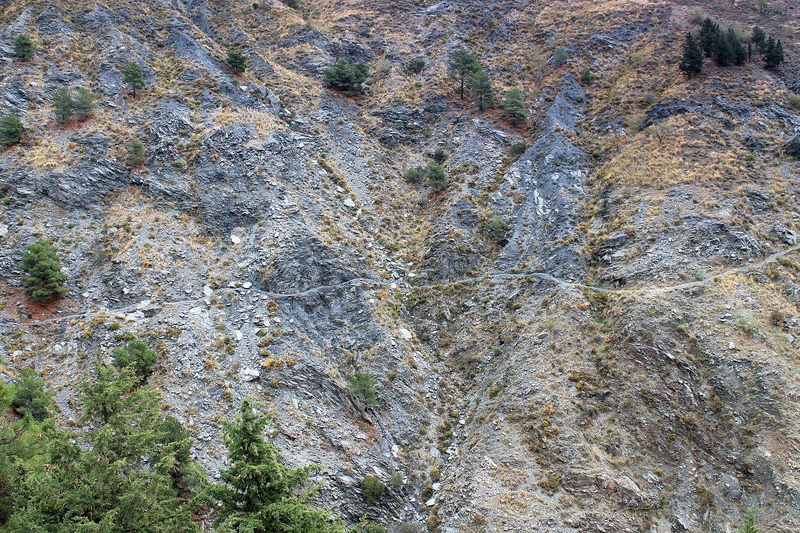 That section of the GR 7 is a pleasure to walk, but rough underfoot. There are lots of stones, and some steep and slippery bits. Worth the effort though. I should have added to my comment in your previous post, the Alpurrajas are an area we stayed in back in 2011. 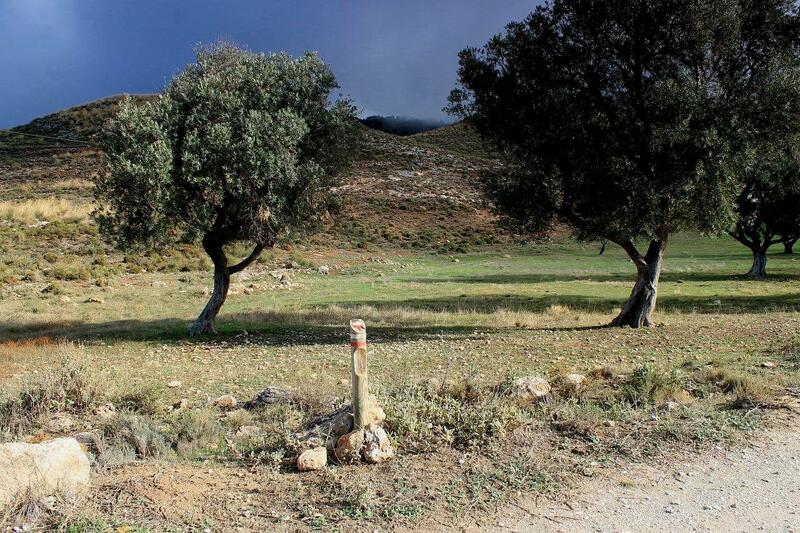 The road between Lanjaron and Orgiva being crossed many times! Particularly liked the shots looking down from the hills over the reservoir! Brought back a number of memories. 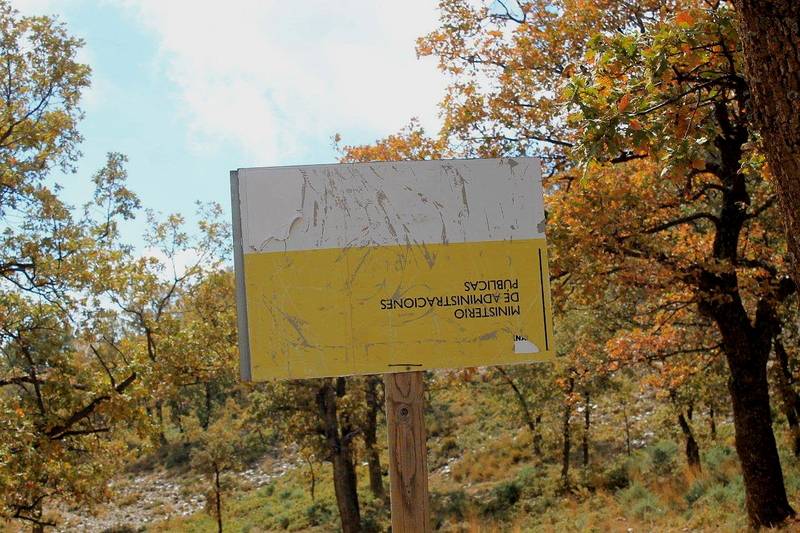 In 1996 they were upgrading the road next to the reservoir – big time. Was chaos. You will be driving over lemons next!!! Hi John. Plenty of olives to drive over after strong winds last week. Oranges and lemons ripening nicely so no doubt they will be next! Hi Hillwalker. Thanks for that.